The California desert has never shown more signs of life than it did this past weekend. 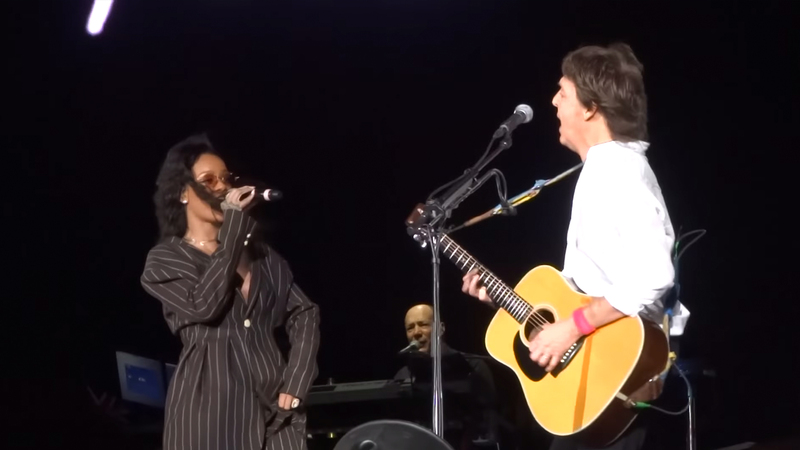 Amidst unforgettable Desert Trip performances by The Rolling Stones and recent Nobel Prize winner Bob Dylan, classic rock legend Paul McCartney also had a refreshing surprise in store for all the desert dwellers in attendance: Rihanna. The “Work” singer graced the stage for a special guest appearance, as McCartney began strumming along to their popular 2015 hit "FourFiveSeconds", which the duo recorded with Kanye West. The British rocker later joked about RiRi’s age, claiming that she was probably one of the youngest people at the festival (which some have been quick to nickname “Oldchella”). From the fan-captured footage, it was obvious that the duet left everyone in awe. Check out the video of the performance below!